Mercy me! I thought I published this weeks ago! All this time I thought I had already shared with you guys this awesome new book that I read! I read this book only because I randomly grabbed it at the library and found out it met a requirement for Megan's Book Challenge. What luck! Because I loved it. I admit, it was a struggle at times, and it took me a while to really get into it, but this book has stayed with me in so many way. So epic. So amazing. Please read. This story will sweep you away. 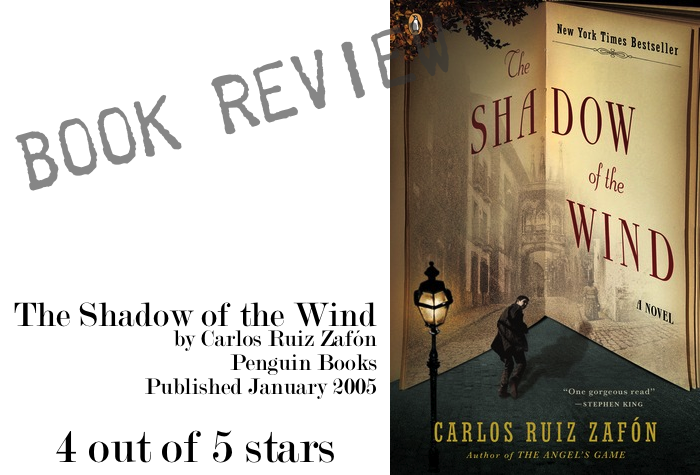 Set in postwar Barcelona, the story weaves through years and generations around a mysterious writer, a book lover, a lost mother, a loyal friend, a sinister villain and a forbidden love affair. The epic romance of the setting and characters will seep into your soul and leave you begging for more. The mystery will haunt you and the love story will break your heart. You don't find this book. It finds you. Recommended for lovers of literature and epic tales. I haven't started reading it yet but I will soon. You really do make the best book recommendations. Read it before and also enjoyed it! Great pick! I have it on my Nook waiting for me and I was kind of putting it off because it seemed so serious. So excited about it now! Sounds interesting, I am adding it to my to-read list. This book has been on my 'to-read' shelf for a while (don't ask me where I got it from) and I've been putting it off, but after this review I'm going to bump it to the top of the list! Thanks! Oh wow! That's funny! It's one of.. wait no, The first Spanish novel I ever read. It was for a Spanish literature class at university. I SO loved this book! I also read El Juego del Angel (The Game of the Angel in English I guess) by CRZ and it was pretty good too. I wouldn't say it beat La Sombra but it was a related story, also in Barcelona, just in a different time with different characters although, if I remember correctly Daniel is older and working at the book store too. I'm glad my challenge led you to a book you loved! I've heard good things from other bloggers, too, so I have it on my TBR list.